Torajaland Round Trip Duration: 4D-3N Expect to be awed by the tribal culture and stunning landscape beauty of Torajaland. Known as Tana Toraja, the region still adheres to their ancient beliefs and rituals that focus heavily on celebration of life and death. Next to their rich panoramic view, the extremely bloody funeral customs is one of the most sought attractions of the region. As this isolated region is now open for public, you will see the marks of the native culture through Ke’te Ke’su & Palawa Traditional Houses, Lemo & Londa stone graves, Marante hanging graves. DAY 1: DEPARTURE TO TORAJALAND Makassar – Pare Pare - Torajaland Upon arrival, you will be welcomed by our guide at Makassar airport. (In case of pre-night in Makassar, pickup at hotel) and travel along the west coast of South Sulawesi where the Bugis tribe lives. Let the guide fill you in with the fascinating history of Bugis native lifestyle and culture. En route to Torajaland, we’ll take you for lunch with a delightful view of the landscape and coast at the harbour city Pare Pare. Passing through the mountain road of Bambapuang, we’ll stop by and let you take plenty of Instragram-worthy photos ;). Arrive at Torajaland in the evening and check-in at your hotel in Rantepao. DAY 2: DAY TRIP IN TORAJALAND 1 Ke’te Ke’su – Lemo – Londa - Rantepao After breakfast, we begin the excursion to Torajaland to some of the must-see highlights there. 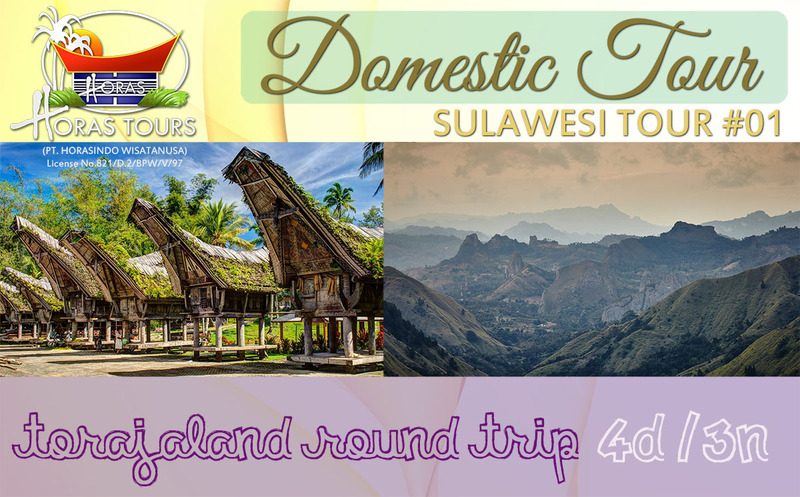 We’ll begin the tour with the ancient Toraja villages Ke’te Ke’su, where you can see the unique traditional houses made out of granaries and filled with woodcarvings details. Then we’ll stop by the stone graves at Lemo and Londa, known as the ancient aristocrats cemetary. The extensive burial cave is right below a massive cliff and if you’re brave enough to squeeze through the tunnels, you’ll get to see some interesting stalactites & stalagmites. Afterwards, we’ll drive you back to Rantepao for lunch and more insights on Torajaland. Return to hotel for free leisure time. DAY 3: DAY TRIP IN TORAJALAND II Palawa – Marante – Rantepao Market On the second day of the amusing Torajaland trip, we’ll take a look at traditional houses at Palawa. These fascinating houses are family heritage inherited from generation upon generation, hence the house details are full of cultural history. Next, we will visit the hanging graves at Marante and experience the dynamic trade at traditional farmer market of Rantepao. Stop by for lunch at Rantepao and return to hotel for free leisure time. DAY 4: SEE YOU AGAIN Torajaland – Pare pare - Makassar After early breakfast, check-out from hotel for 7am departure to Makassar. On the way to the south of the island, you will be greeted by scenic view of coffee, cocoa and clove plantations. Take another shot at Bambapuang mountain road with the morning light before reaching the harbour city Pare Pare for lunch. Afterwards, we’ll take you back to Makassar airport for your flight departure.